How would you feel if Bernie Sanders ran for president in 2020? 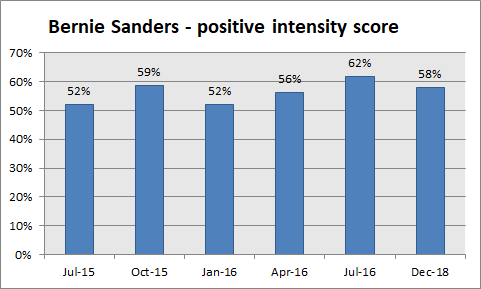 That's what USA Today and Suffolk University asked Democrats and independent voters in a recent poll - and the results, some pundits argue, don't look good for Sanders. "Sanders has the highest 'don’t run' of any candidate," John Aravosis writes. "Bernie’s negatives are shockingly high." Here we see the real significance of Seth Ackerman's numbers: support for Sanders is extremely polarized on racial lines, significantly moreso than with any other candidate. His net 19 point support from black voters is separated from his net 23 point opposition by an enormous 42 point gap. Intuitively, my explanation is that Sanders is advancing a vision of politics that challenges white privilege in a way that black voters broadly support. But however one wants to explain these differences, it seems clear that broad declarations about opposition to another Sanders run simplify a much more complicated racial divide. Sanders attracts the intense support of a small left-wing intellectual vanguard who see American politics in fundamentally terms than most Democrats do. The primary struggle in American politics as they see it is not between liberalism and conservatism, but between socialism and capitalism. I think [Chait]...ends up wildly overstating the policy content of pro-Bernie punditry...it's not fundamentally "about" policy - it's about specific human beings' control over the levers of power...it's fundamentally about *who gets to be in charge* rather than about what the policy is going to be. Chait is simply rehearsing the core argument that centrist groups like Third Way will make against Sanders in the coming year: that democratic socialism is extremist and unpopular. He concedes that Sanders pundits have a distinct ideology - but he only does this because he wants to vilify it, and to insist that the broader mass of Sanders supporters don't actually buy into it. Yglesias is positioning himself on the left wing of respectable punditry. Here, this means defending himself against Sanders pundits who threaten to outflank him by insisting that they're engaged in an empty power-play rather than in a substantive fight for policy. This kind of disagreement will probably define Sanders-skeptical Democrats for the foreseeable future. And for what it's worth, I think that Chait's camp has the clearer view of the fight at hand. Yglesias belongs to a camp of Democrats that forged its identity in reaction to third way centrism: skeptical of cooperation with Republicans, and even open, in theory, to politics once vilified as "leftist". Today, however, that position has become much less coherent as it encounters a left politics - democratic socialism - that it hesitates to take seriously. Yglesias is struggling to maintain a political identity that is somehow distinct from Chait's left-skeptical centrism, and that's why he keeps getting mired in speculation about the motives of his critics, or in definitional arguments about what "democratic socialism" really means. Chait, meanwhile, knows exactly what it means - and that's why he wants to see it fail. On November 26, Texas Democrat Beto O'Rourke announced that he would not "rule anything out" regarding future political ambitions - which the media unanimously reported as a sign that he might run for president. Immediately, O'Rourke received a surge of positive coverage from pundits like Chris Cillizza, Dan Pfeiffer, and Timothy Murphy. A new Political Action Committee launched dedicated to drafting Beto. The Hill reported a "lovefest for O’Rourke"; Vice Asked Beto's Biggest Fans Why They Love Him So Much, Newsweek headlines declared "Beto O'Rourke 2020 wave grows" and TMZ breathlessly informed us that Beto wanted to be in the Beatles. All of this happened before the major milestones in the Vast Anti-Beto Conspiracy: a banal tweet from David Sirota on December 2nd, and a Washington Post column from Elizabeth Bruenig on December 5. People are talking about Beto because the press gave him a massive wave of swooning coverage at the end of November. Critics are responding to this because people tend to talk about what is going on in the news. Clinton partisan Jill Filipovic criticized the press's "Beto-mania"; reactionary and rumored vampire Kevin Williamson declared that Democrats are "mad for Beto"; and yes, socialists like Branko Marcetic also noticed the "Beto-for-president mania sweeping liberal America". Of course Sanders supporters are talking about this too. The only real mystery is why so many journalists are playing dumb about it, and pretending that there is some unique significance in the Sanders camp responding to the same news that everyone else has been responding to.